Last weekend, PAX East 2019 was held in Boston, MA, where attendees and exhibitors from around the world gathered to play and celebrate games both old and new. And wouldn’t you know it, the selection of indie games on display was as strong as it’s ever been, particularly due to the absence of any major announcements from larger publishers and stories—Borderlands 3 notwithstanding. For me, there’s usually one game every PAX East that blows me away, to the point that I’m tripping over my words when I tell my colleagues and friends that they have got to check it out…but that didn’t happen this year. Instead, there were plenty of games that I played that excited me, but most were either early in development or would require more hands-on time before I could really fall for them. Without further ado, here are the best indie games of PAX East 2019. I’m not one to usually play mobile games at PAX, but Alt-Frequencies sets itself apart quickly thanks to its audio-based gameplay and premise. The world is stuck in a time loop, and by manipulating information spoken over the radio—whether it’s from a college campus station, conspiracy theorists, or train managers—you’ll influence the outcomes of future loops. It took some time for me to get used to the core mechanic of isolating lines of dialogue and hacking other news stations to spread the message, but once I did, it all clicked. Alt-Frequencies is well worth a look if you enjoy tricky puzzles coupled with a unique presentation. I have not played Night School Studio’s Oxenfree, which by all accounts is very good. That’ll have to change soon, because their second game, Afterparty, is brimming with such charm and wit that it has quickly become one of my most anticipated games of the year. 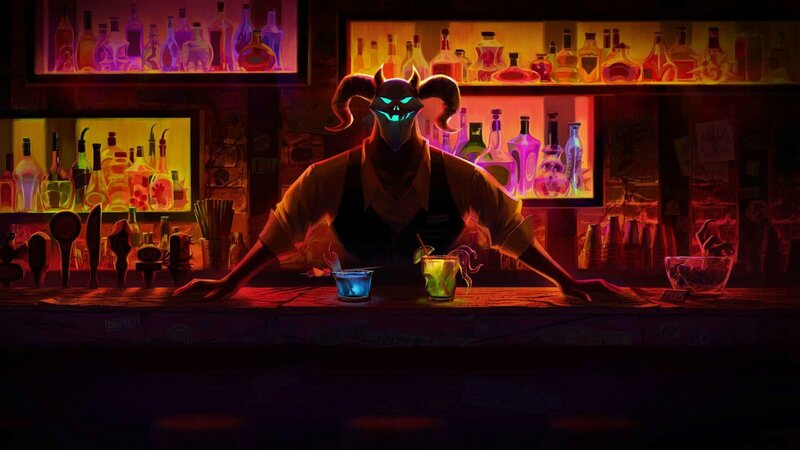 Afterparty follows two young adults, Lola and Milo, after they die and go to Hell, only to try and escape by out-partying Satan himself. There’s beer pong to be played, serial killers to impress, and plenty of alcohol to chug, the latter of which grants you additional dialogue options depending on the drink. It’s a delightfully absurd take on Hell, and based on the quality of the writing here, is one I can’t wait to play in full. Part pinball, part Breakout, and part hack-and-slash, Creature in the Well is a game that is as weird as it is fun to play. As the last of a line of engineering robots, you must venture into a mountain to restore power to a crippled city that is plagued by a giant monster. With different types of weapons at your disposal, you must strike and charge balls of energy in order to solve puzzles, defeat enemies, and generally play a very mobile game of pinball. It’s a strange, albeit engaging, combat system. Coupled with a striking visual style, and Creature in the Well is something I am excited to play more of. Falcon Age comes out soon, which is comforting considering all I wanted to do after playing it at PAX East was to play it even more. Set in an alien world that is being colonized by a machine corporation, you play a falconer named Ara who seeks to kick start a revolution with her trusty bird. The falcon is a blast to interact with, and the game itself shares many elements with Ubisoft titles in its focus on clearing out outposts. It’s not as grand as those games, but it doesn’t have to be, and I think players will be in for a treat when Falcon Age launches in just under a week. Get In The Car, Loser! is a lesbian road trip RPG. That’s how Love Conquers All Games sums up its weird and totally awesome game about friends road tripping to stop the rise of an ancient evil, but it doesn’t adequately describe just how interesting it truly is. The core cast of characters has a great dynamic, brought forth thanks to excellent writing, the combat is like that of a simpler Valkyria Profile, and the music is easily one of the best soundtracks I’ve heard in an indie-RPG in years. Keep this on your radar, because judging from the past titles from Love Conquers All Games, Get In The Car, Loser! is going to be a blast. Heave Ho was one of the best multiplayer games at PAX East this year. A four-player local co-op physics-based platformer, players control a little blob with two arms who must grapple and swing with his friends to reach the goal in each level. This is a lot harder than it sounds, but my time with it was defined by laughter and good-humored ribbing that made it funny rather than vexing. There was always a well-deserved crowd around it on the show floor, and it reminded me of Mount Your Friends in more ways than one. Better yet, developer Le Cartel Studio lets you customize your avatar, making it look like 2B from Nier: Automata. You really need to sit down and play Heave Ho when it launches this summer. Sometimes you play a game that feels great the moment you pick up the controller. KUNAI is one of those games, and considering it’s a Metroidvania, all the more reason to be excited. Set in the far future where machines and over-the-top Japanese action films collide, KUNAI stars a machine that has a tablet for a head that can also skillfully use a katana, P90s, and rope-dart kunais. Though the overarching plot and lore wasn’t explained well in my short demo, the basic gameplay loop of running, slashing, and swinging through levels sold me on it long before I was curious. For a game that is still a long way away from release, the fact that KUNAI already controls as well as it does means I’ll be keeping an eye on it in the months to come. Little Friends: Dogs & Cats is a game where I put a bow and bandana on a Japanese cat, at which point I proceeded to pet it for several minutes because Alex is the most adorable kitty. It’s the Nintendogs game on the Switch you’ve been waiting for, and even though I’m not a huge fan of those games, I feel like Little Friends will win over many players who have been clamoring for a proper sequel. Yes, this is this free DLC for The Messenger. It may not be a full-fledged game like the others on this list, but it is radical and deserves to be played. It’s just as humorous as the main game, which I adored, and promises a unique twist on the mechanics that is bound to test those who have previously conquered it. Picnic Panic arrives this summer, and you should seriously play The Messenger before it lands. I finally had the chance to play My Friend Pedro over the weekend, and was the wait ever worth it. This surreal action game is over-the-top, where flips and dual-Uzis are the name of the game. It controls well, and it only takes a moment to understand just how wacky this game can get thanks to the talking banana, Pedro. It’s a great fit for Devolver Digital, and My Friend Pedro is bound to attract loads of players when it launches later this year. Radical Rabbits Stew surprised me. I had no knowledge of this adorable puzzle game before I sat down to play it, but I was quickly charmed thanks to its easy to understand gameplay and satisfying pixel art. In short, you are a cleaning boy at a famed space diner that has had all of its chefs kidnapped by evil rabbits. Your new job? 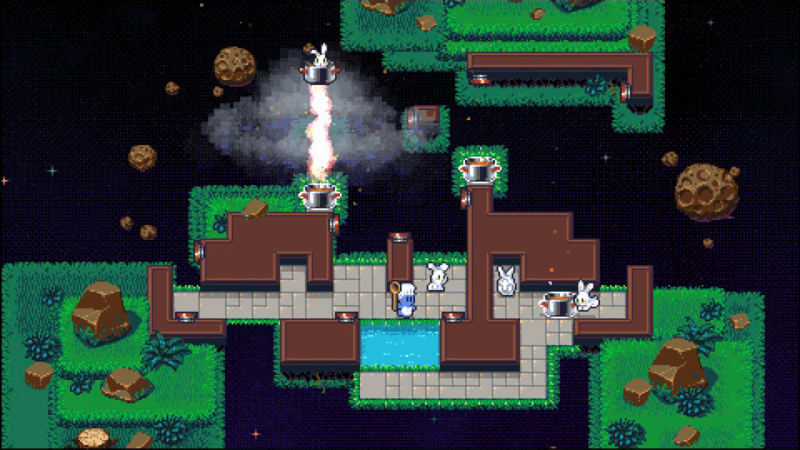 To rescue the chefs by smacking rabbits into pots of stew, which then rocket off into space. Far from being cruel, Radical Rabbits Stew was whimsical, and it’s a game that has a lot of potential should its later levels match the quality of its intro. We’re seeing an influx of games inspired by Darkest Dungeon in recent months, and Vambrace: Cold Soul is certainly one of the most intriguing. With a light anime aesthetic backing it, you play as Evelia Lyric as she mounts an expedition into a frozen city in search of what lies at its heart. Rather than improving your party through leveling up, you’ll improve them by creating and crafting artifacts that can be lost if your characters fall in battle. Vambrace looks to be challenging based on what little I’ve played, and it’ll tide over all of us who are patiently waiting for Darkest Dungeon 2.